The number of crushed and rotted-to-dust cars outnumber the still-usable cars by a factor of thousands to one. But what car represents the will to survive, by way of primary engineering or owner love? What car is the ultimate survivor? 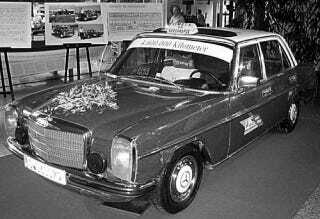 I'm going with the moon-and-back Mercedes 240D taxi, donated by its Greek owner to the Mercedes-Benz museum in Stuttgart. The owner, Gregorios Sachinides, clocked enough miles to take six trips to the moon and back, or 82 times around the earth. What others are there?